Times of Malta 22/10/2014: The number of first residence permits issued by Malta last year was by far the highest among EU member states as a proportion of the population. 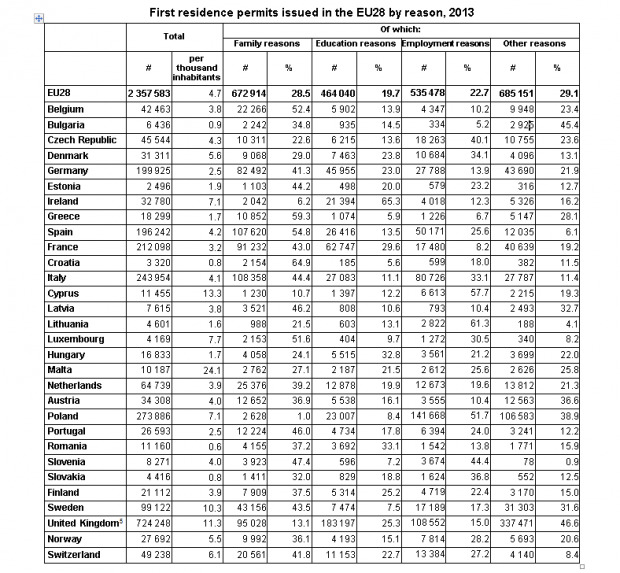 Data issued this morning by Eurostat shows that 2.8 million residence permits were issued by the EU’s 28 member states in 2013. In 2013, the highest number of residence permits was reported by the United Kingdom (724 200 residence permits issued, or 30.7% of total permits issued in the EU28), followed by Poland (273 900, or 11.6%), Italy (244 000, or 10.3%), France (212 100, or 9.0%), Germany (199 900, or 8.5%) and Spain (196 200, or 8.3%). Together, these six...read on.